On the planet of Ranskoor Av Kolos, lies the remains of a brutal battlefield. 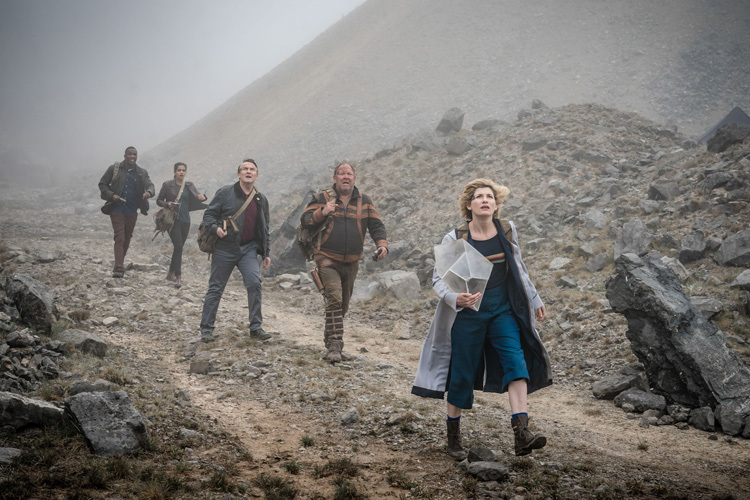 But as the Doctor, Graham, Yaz and Ryan answer nine separate distress calls, they discover the planet holds far more secrets. Who is the mysterious commander with no memory? What lies beyond the mists? Who or what are the Ux? Well they say good things come to those who wait. So maybe the final episode will be more like Doctor Who, rather than this light weight over indulgent pc agenda driven non escapism. Doctor Stu – could it not all be, for example, some ancient, untranslatable language? Ranskoor Av Kolos = Skaro. I am indeed only wildly speculating, but I enjoy wildly speculating. It’s a good way to pass the time now and again, and sometimes (not often of course) I manage to tap into something. That could or could not be the case here. Not a clue. I promise you, my hopes of being correct are not set at any great height at all. I wouldn’t get too excited! In reference to the earlier comment about Skaro, the planet they’re on gives me some Genesis battlefield vibes. Maybe it’s just because they’re in a quarry, but it just seems too coincidental. All for new monsters as well. ArtInventor.Just as long as they add something to the table like the golden oldies when new did. When somethings created in sci-fi especially it’s extremely rarely that that anyone really knows if it will take off. After all Sidney Newman before he came to love them to bits for their viewing power originally HATED the Daleks. This may or may not mean anything, but you can spell “Skaro” twice over from that title. Coincidence or design, me wonders? (Could very easily be coincidence of course). Judging by the series so far, I don’t expect a fitting finale. At the moment Doctor Who is better on Saturday nights on the ‘Drama’ channel from 7.00pm. They are re-showing Series 2, David Tennant’s first series again. Two episodes every Saturday night. They are much much better than the so-called Doctor Who we get today. I suggest Chibnall watches them. Just to remind him how good Doctor Who can and should be. Remains of a brutal battlefield? A deadly reckoning? I’m certainly intrigued. I’m hoping for something on a grander scale here. I had heard about the ux with the teaser clues just before the series started. I really hope this finale delivers the goods.